I don't know how it has been a month since I last posted ANYTHING. I have kept busy. I sang my auditions for the Center for Contemporary Opera (CCO) and for the Philadelphia Symphonic Choir (PSC). Both of these were really great experiences. I was going into my CCO audition knowing that a prior maestra of mine was a frequent flier in the company. I was very excited because I knew that if I was lucky and my audition went every shad of right that it could go; I migh have the chance to work with her again. What I couldn't have imagined is that she would be in my audition. I got to the Opera America building for my audition on the early side. I walked in, registered, and got a bit chatty with the girl helping run the hallway. When a singer showed up a little closer to, exactly, on time, they asked if I would be comfortable going early. I felt so comfortable with my new aria (Emily's Goodbye Aria from Our Town). I walked in and sang through my whole aria and I got to talk to the maestra that I know. She asked me about different ensembles I had been in. They said there was an opera that will be done acapella and even thinking about that nearly a month later I can't imagine how cool that will be. Long story short, with this audition, I felt like I had sung my best. In fact, I don't think I could have sung better and I've never been so proud of myself. But... To be extremely honest, since that audition I've gained a new level of confidence and no matter the outcome I do not believe I could have done anything differently. During Easter services I sang "Thy rebuke hath broken his heart", "behold and see", and "I know that my Redeemer liveth" from Handel's Messiah. Handel is difficult for me. It asks for a different kind of treatment than most vocal music and it usually makes me very tired. Apparently every step I've taken has led me to the time where Handel no longer makes me vocally tired. And, may I add, I have found that I love it. Today I had an audition for The Philadelphia Symphonic Choir. This is a choir that will become he professional choir for the Philadelphia Orchestra. The season next year looks very exciting. If I get a position I will be involved in at least one of the following programs; Mahler Symphony No 3, Handel's Messiah, Orff's Carmina Burana. I would be particularly excited about that last one because I have sung in the children's choir for that piece at least three times but haven't been in the adult choir yet. Well... Today, I went in for my audition. My to her knew the person running it and had nothing but good things to say. Basically, assuring me that when he says he's looking for a choir, he really wants full voices and not choir boys (which most definitely have their time and place). I went in and sang the recitative from "Come Scoglio" (Mozart). That went really well. Then I expressed that I had brought "I know that my redeemer liveth" (Handel). 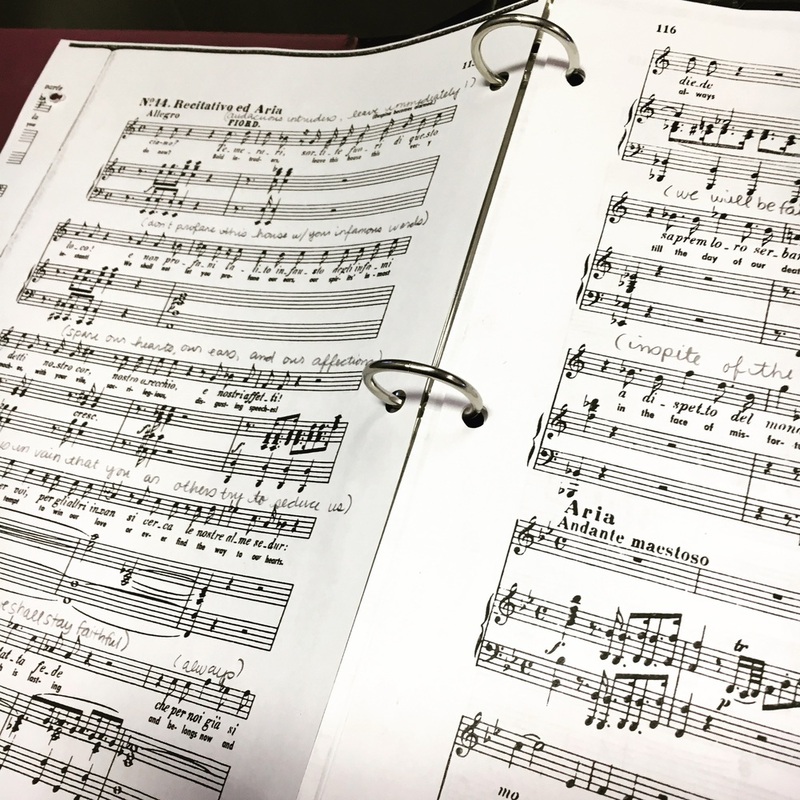 Now, to be perfectly honest, although I know this really well I haven't sung it for memory and was feeling fancy; so I went into my audition with out my music. (Luckily I feel like I can usually cheat with Oratorio... Since performance practice states you can use music). The Handel went relatively well even though I had a weird moment in the beginning (DUE TO THE FACT THAT I FORGOT WHICH CUT I WAS DOING...). Anyway, aside from the small mishap I felt like everything else went relatively well. Guess I will find out. On an almost different note, Alice Ford is going very well. I have acts 1, 2, and 3 learned. I am close to memorizing act 1 and I'm feeling really good about the memorizing process on act 2. I am very excited to start rehearsals though as I bet once I'm with the other singers the show will really come to life. I will do better to keep everyone updated. More soon.